Beautiful 1956 Chevrolet Nomad Wagon - "The Wanderer"! Check out the beauty that is “The Wanderer”. This ’56 Chevrolet Nomad Wagon attracted a lot of attention at the 2016 NSRA Street Rod Nationals. This build that’s been loaded with custom features, is a product of love and ton of attention by the extraordinary Jim & Melissa Boitnoitt. 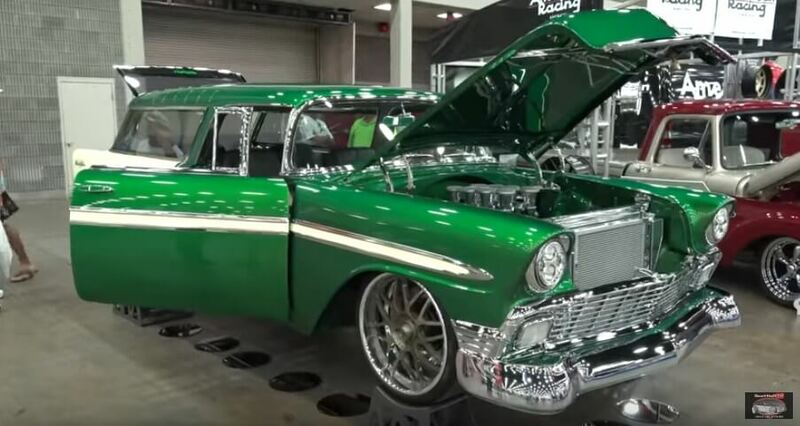 This freshly restored Chevy Wagon has a lot of cool mods, like the shaved hood, narrowed bumpers and the custom one piece window. The custom mixed Green & Cream pearl paint by the House of Kolor helps a lot for the overall looks. “The Wanderer” was built on Roadster Shop chassis and sits on a big American Racing wheels wrapped in low profile Pirelli GT tires. Under the hood, you’ll find a Rob Morse built 429 cui 2015 Chevy LS3 V8 engine, delivering more than 600 hp through the 4L60E transmission provided by Coan Engineering. ScottieDTV knows how to find them. Skylark car from 1966 – A Buick funny car that’s a shop stopper! The Ghost Rider performing a 354 km/h wheelie top speed with his Hayabusa Turbo 499bhp! Travis Pastrana doing double back-flip on two wheels! Pickup truck vs. vertical sand dune in Saudi Arabia! 2017 Acura NSX sold for $1.2 million – First production!